When we practice bhakti-yoga, we frequently find ourselves relapsing to worldly anti-devotional indulgences. Why does this happen? Because in the school of devotion we are often unwilling learners. That may indeed be our aspiration, but often it is not sufficiently internalized. Much more deep-rooted are our desires to enjoy worldly things – desires that we are still unwilling to give up. In that sense our lesson to love Krishna is learnt unwillingly. 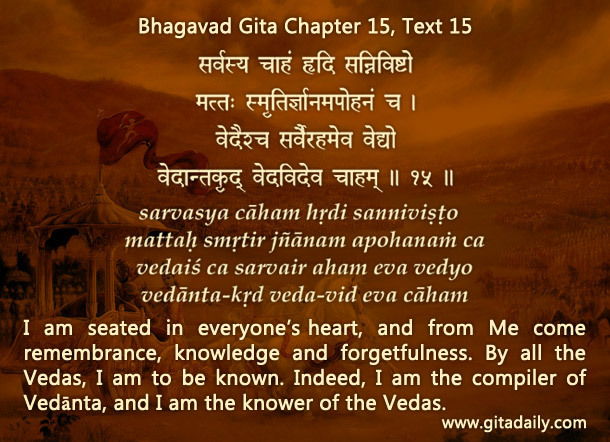 The Bhagavad-gita (15.15) indicates that Krishna residing in our heart gives us knowledge, remembrance and forgetfulness, according to our desires. When he sees that we are still entertaining worldly desires, he reciprocates by giving us forgetfulness of spiritual knowledge. Thus does our learning become unlearnt. This unlearning is willing in the sense that it is our will to enjoy worldly things that causes the unlearning. Despite such unlearning, we don’t have to become discouraged. Because even through the unlearning, learning can happen. The cycle of learning and unlearning can help us realize how superficial devotion is inadequate: it deprives us of the steady fulfillment latent in a substantial connection with Krishna. Thus we learn the necessity and urgency of internalizing our devotional aspiration. Learning this may not stop our lapses immediately, but it can inspire us to boost our intellectual conviction by scriptural study, build our spiritual determination by associating with serious devotees and beseech Krishna with sincere prayers. Our intensified endeavors show him that, despite our lapses, we really want to love him. And he reciprocates by giving us the right remembrance at the right time. By his reciprocal mercy, our learning, far from getting unlearnt, blossoms into living, and we progressively graduate from the school of devotion to a life of eternal ecstatic love. As long as we seek what is to be found is not experienced. ‘Seek and thou shall find’ is sublimated in ‘find and thou shall not seek anymore.’ Mam ekam saranam vraja. Surrender unto Me. Lord Sri Krishna is fully present within His Name. Krishna’s Name, our highest designation, Home, is here and now. That supreme awareness is not experienced on autopilot. There are many distractions so we have to navigate our chanting carefully and with intense focus. Then, by His unlimited grace, we don’t have to seek for Krishna anymore and we overwhelmingly realize that He has already stolen our hearts. That’s a wonderful explanation in your podcast Chaitanya Charan das Prabhu. I once explained this to a math professor stating that infinite and infinitesimal are necessarily dynamic numbers: they are always increasing and decreasing respectively. Once agreed upon that it was easy to explain that there is a directional difference between the two: the Lord infinitely being bigger and the soul infinitesimally being smaller. This makes the quantity span of Love between the Lord and the soul eternally increasing and the meeting of the two, on the quality end of the spectrum, is therefore always more intense.